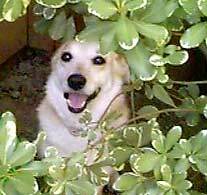 Daisy is Zippy’s Corgi-mix friend. Sometimes she looks very Corgi-like, and sometimes not at all. A former pound critter, Daisy wants to remind you that many wonderful animals are waiting to be adopted at your local animal control center. Daisy is a well-behaved sweetie who loves to give kisses and go for long walks. She does a very cute happy dance at dinnertime, and has an interesting vocabulary of odd sounds. Daisy has her own site at www.otherdog.com.